It’s no secret that I love to cook. I often think what might have been if I had gone to culinary school straight out of high school, instead of joining the Navy. Things might certainly be different today. I spent most afternoons hanging out in the library, in the suburban New Jersey town where Mom and I lived in the mid-1980’s. I would read about all these wonderful New York restaurants, some of which are not around any more — places like Lutèce, An American Place and Windows on the World; Auntie Yuan, Chiam and Phoenix Garden. When I moved to New York in November 1988, it was not quite the Disney-fied “Mall of America” that you see today. Ed Koch was mayor, and the crime rate was sky high. The City was grittier then, having lost none of its roughness that made it a dangerous, yet attractive place to live in the 1970s and early 1980s, as only the young and adventurous can. It’s rather tame now, but only to long-time residents like me. People who visit the City these days may remark how sophisticated it seems, compared to Peoria, Illinois or St. Louis, Missouri. Perhaps that is true. Having been a New Yorker for over two decades though, those rough edges that made the City seem so attractive back then have given way to a blandness that, while comforting in some respects, is terribly dull once you look closely. True, I don’t need to worry about being mugged in broad daylight or while coming home from a night on the town. True, our quality of life seems much better. That being said, there’s a certain electricity or energy that seems to be missing, that was much more prevalent back then. Or maybe, I’m just getting older and more nostalgic for days long past. Ceci e pomodoro bruschetta — otherwise known as chickpea and heirloom tomato bruschetta. 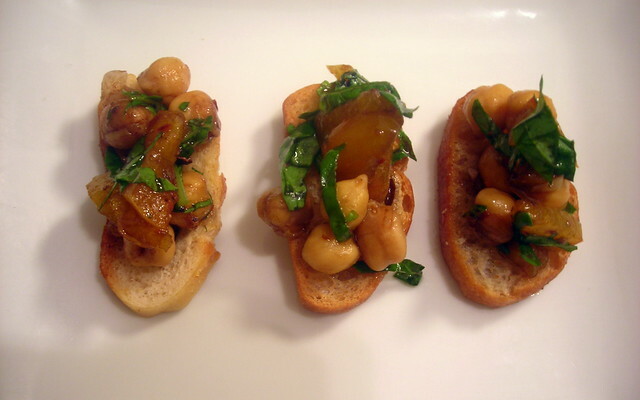 This is a riff on Mario Batali‘s white bean bruschetta which originated when he was the chef and owner of Pó Restaurant, the precursor to his flagship, Babbo. This is addictive and simple — 1/2 cup cooked chickpeas, 1 diced heirloom tomato, 1 minced garlic clove, 2 teaspoons balsamic vinegar, 3 tablespoons extra-virgin olive oil, sea salt and red pepper flakes to taste, and a chiffonade of basil and/or mint. Combine all ingredients and spoon atop crostini or sliced toasted Italian bread. Alternately, cover the chickpea mixture with plastic wrap and chill for a few hours in the refrigerator, to let the flavors meld. Steam cleaned, de-bearded mussels with a splash of white wine and some extra-virgin olive oil; when done, remove the mussels from the pot and strain the mussel cooking liquid. Discard any mussels that don’t open. Remove the mussel meat and reserve. Melt some unsalted butter in a skillet, then add some chopped garlic. 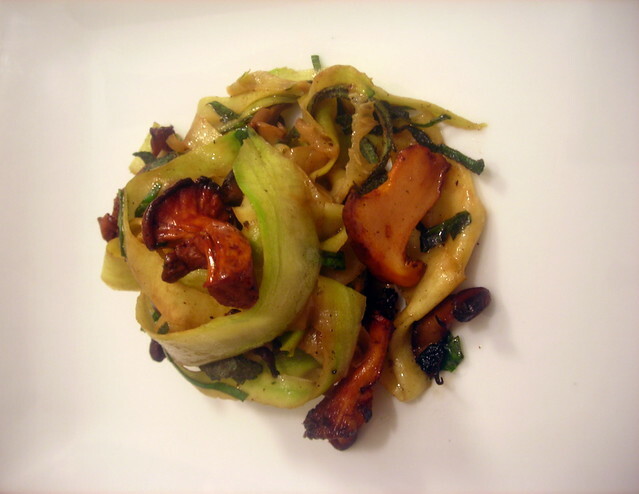 Once it turns a pale gold, about say, 30 seconds to a minute, add some sliced chanterelles and cremini mushrooms. If you don’t have any of those, you can use regular white button mushrooms instead and it will be fine. Sauté the mushrooms until they become tender, about 3 to 4 minutes. Add the mussels, a teaspoon or so of lemon juice (or you can just squeeze the juice of a quarter lemon into the pan), the mussel cooking liquid and some torn sage leaves. Stir occasionally; the mussel/mushroom mixture is done when the mussels have been warmed through. Taste for salt and pepper. The “pasta” is just shaved zucchini which I shaved with a vegetable peeler. You can, if you want, use a mandoline for slightly thicker “noodles”. If you elect to use one, please be sure to use a hand guard so you won’t get injured. Add the zucchini “noodles” directly to the pan and cook VERY BRIEFLY (15 seconds is more than sufficient). Toss once or twice, then remove the pan from heat. Spoon the “pasta” mixture onto appetizer plates and serve at once. 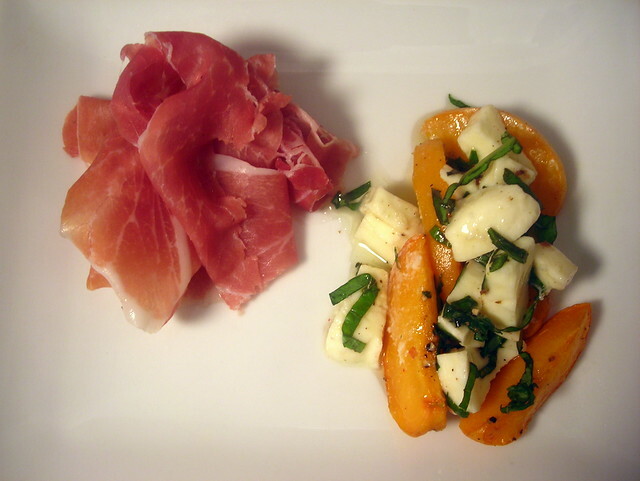 I love the combination of prosciutto or ham with fruit, such as cantaloupe or honeydew melon, or sliced fresh figs. The combination of sweet and savory, paired with a delicate creaminess that fresh mozzarella cheese provides is a delicious prelude to dinner. Prosciutto crudo is simply thinly-sliced prosciutto that’s served uncooked. You can obtain this at either an Italian specialty food shop or at any good delicatessen. This differs from cooked prosciutto, which is called prosciutto cotto. Make sure that the apricots are ripe. Remove the pits from the apricots and slice into thin, bite-sized wedges. Toss the apricots with a teaspoon of extra-virgin olive oil, a very tiny amount of sea salt and freshly milled black pepper. Place the apricots in a Pyrex baking dish or roasting pan and roast for 10 to 15 minutes at 375 F. You don’t want to roast the apricots for very long, otherwise they’ll caramelize and lose their shape. Let the apricots cool slightly, then combine with cubed fresh mozzarella and thinly sliced basil or mint leaves. Mound the prosciutto attractively on small plates. Spoon the apricot mixture next to the prosciutto, then serve at once. Each of these appetizers takes about 20 to 30 minutes to make, including prep. The chickpea and heirloom tomato bruschetta is vegan but not gluten-free, the zucchini “pasta” is gluten-free (but not vegetarian), and the prosciutto plate is gluten-free (but not vegan or vegetarian). 25 Jul	This entry was published on July 25, 2012 at 2:41 am. It’s filed under cooking, food, food photography, Gluten-Free, Italian food, New York City, recipe, summer, vegetarian, writing and tagged appetizers, apricots, chickpeas, food photography, Italian food, mushrooms, mussels, summer, tomato, zucchini. Bookmark the permalink. Follow any comments here with the RSS feed for this post.